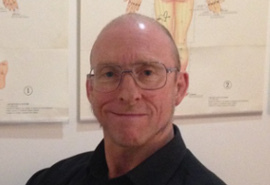 Dr Giles Sadler is a very knowledgeable and dedicated Chinese Medicine practitioner who takes a practical approach to treatment to get the most effective results for his clients. With his direct methods, you can be sure that he is getting straight to the root of the problem and that you, as his client, will understand what is going on with your health and how treatment will help you. He is interested in treating all health conditions but a lifetime of sport and physical training has given him a special interest in musculoskeletal issues including lower back pain, neck, shoulder, and upper back pain, knee pain, and tendinopathies. He also does a lot of work with digestive issues such reflux, bloating, constipation, Irritable Bowel Syndrome, and food intolerances. His passion for Chinese Medicine is shown by his constant seeking of further knowledge. He has the benefit of learning with a renowned Chinese Herbalist and Chinese Medicine Gynaecologist, Steven Clavey, on a weekly basis and he also broadened his knowledge and experience through his volunteer work at the Wellington Collingwood, a community centre for isolated and disadvantaged people, which exposed him to a large variety of conditions. Health is not just something that Giles promotes to others but it is a part of his lifestyle. He cultivates his health daily by practicing Tai Chi daily and he complements this with teaching and training in a traditional Japanese martial art, Aikijujutsu, in which he currently holds a 5th degree black belt, at the Melbourne Aikibujutsu Club. Through his internal and external martial arts training, you will find that he is very grounded, sensitive and has an excellent grasp of Qi (energy) who is very present to your needs. Giles graduated from the five-year Bachelor of Applied Science (Chinese Medicine) and Bachelor of Applied Science (Human Biology) from RMIT University with distinction. He has complemented his knowledge from university with an internship at the prestigious Jiangsu Provincial Chinese Medicine Hospital in Nanjing, China, where he saw a very wide range of conditions and learnt about different approaches to treatment. He is currently registered with Australian Health Practitioner Regulation Agency (AHPRA) and is a member of Australia’s peak professional body for Chinese medicine, the Australian Acupuncture and Chinese Medicine Association (AACMA).